The events, organized by students from the LAU–MEPI Tomorrow’s Leaders program and the Campus Student Council, will run till February 27. 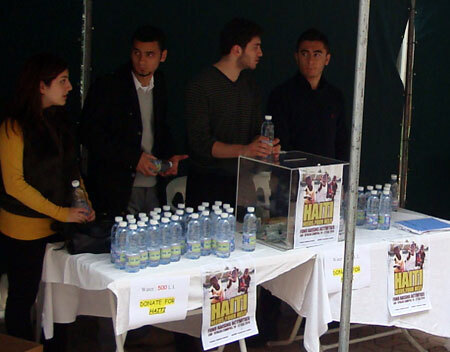 The fundraising campaign for Haiti was launched on February 19 outside the Science Building at LAU Byblos. LAU–MEPI Tomorrow's Leaders students Humam Wasfi (left) and Rawaz Marouf (right) collecting donations for the Haiti disaster with the help of student Alfred El-Khoury. Students give away water bottles provided by Sannine for every donation received. On February 20, a handful of students visited the weekly LAU MUN meetings of high schoolers in both Beirut and Byblos to raise awareness and funds for the campaign. Click on any photo above to view all four images. A team of about 30 students from LAU Byblos launched a weeklong campaign on February 19 to raise funds for the victims in Haiti, following the tiny island’s massive earthquake on January 12. The students are members of the LAU-Middle East Partnership Initiative Tomorrow’s Leaders program — which offers scholarships to students from around the Arab world — and the Byblos Campus Student Council, who are coordinating with the Byblos Guidance Office to organize a series of events that will run through February 27. To date, over 200,000 people have been confirmed dead as a result of the earthquake — roughly the same figure that are estimated to have been killed over the 15 years of the Lebanese Civil War. The fundraising campaign began around 8:00 a.m. as students stood at the entrances of the campus to hand out awareness-raising flyers. By 9:00 a.m., the students had set up a stand facing the Science Building where they were already receiving donations. Marouf says he hopes to raise about $10,000 over the week. Over the weekend, some of the students involved in the campaign visited the weekly LAU Model United Nations training sessions, which are held in Beirut and Byblos for high schoolers, to give presentations promoting their cause. A film screening is scheduled for February 23 at the Selina Korban Auditorium to raise awareness about the disaster. The biggest event will take place on February 24 during the “Tombola,” a raffle where students can purchase tickets to win over 100 prizes including airline tickets — at least two local travel agencies have offered tickets to Bulgaria and Cyprus. There will also be an assortment of donated products for sale such as mugs and stress balls, as well as 2,400 bottles of water donated by Sannine and 400 donuts offered by Dunkin’ Donuts. 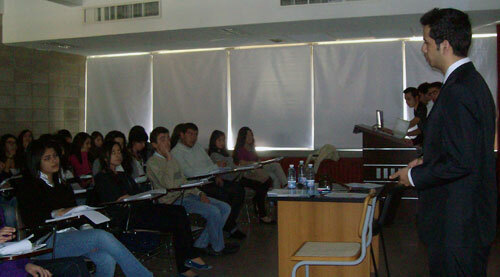 The same day, at 1:00 p.m., stand-up comedian Tony Abou Jaoude will give a performance at the Selina Korban Auditorium. “If this campaign proves to be successful, we’re going to try to expand it to the Beirut campus,” says another MEPI TL student from Iraq, Humam Wasfi, a first-year business management major. Last month, four student clubs raised funds for Haiti on the Beirut campus.